The Shaheed Girls Orphanage, located at Oleander Gardens, East Coast Demerara, engulfed by flames in October. 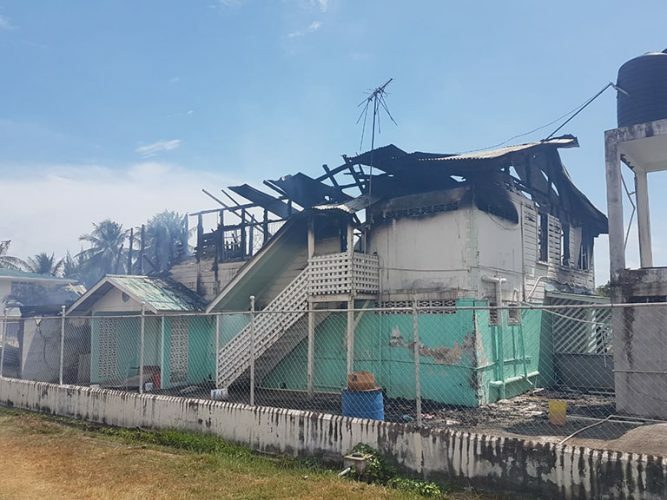 A fire of unknown origin gutted the Shaheed Girls Orphanage at Oleander Gardens, on the East Coast of Demerara early yesterday morning, displacing 18 girls and causing millions of dollars in losses. The fire started at about 6 am and within minutes ripped through the two-storey wooden and concrete structure, located at Lot 7-8 Oleander Gardens. No injuries were reported as the caretaker and all the girls managed to get to safety. 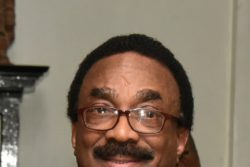 The fire started on the upper flat and a source told Sunday Stabroek that investigators do not believe it was electrical. The preliminary investigation that was conducted yesterday by fire service officials revealed that caretaker, Shanti Pooran, 59, was alerted by an orphan that smoke was emanating from the upper flat of the building. The building, which was not insured, housed the living quarters and prayer room on the upper flat and a kitchen and dining area on the lower flat. Pooran raised an alarm after she was alerted about the fire and the Guyana Fire Service and police were summoned. When this newspaper visited the scene yesterday morning, hours after the fire started, firefighters were still present dousing the remaining structure, which was still smoking. Residents said they were alerted after they saw thick smoke coming from the building. They said they immediately assisted in getting the occupants to safety. One woman, who wished not to be named, said she was on her way to work when she noticed a large crowd, including the girls, standing on the road. Upon enquiring, she said, she learnt the building was destroyed in a fire. “When I watch I saw the entire place was burnt. 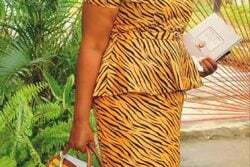 Everything had already finish and the fire truck and so was on the road,” the woman related. The incident has left Pooran traumatised. The caretaker told this newspaper that she and a few of the girls were doing chores when they noticed the fire. “All we see is smoke. I don’t know which angle it was coming from and I didn’t hesitate and I tell the girls them run. And we run out,” she said. Raheema Rahaman, Chief Executive Officer (CEO) and treasurer of the Shaheed Boys and Girls orphanages, explained that she was at her East Bank Demerara home when she received a call from Pooran, who informed her of the fire. 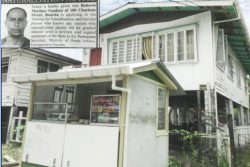 “She [Pooran] just said that the place is on fire so I just didn’t listen to anything more I just told her get the children out and she said she had already had the children them so I just race down to the scene,” Rahaman recalled. She said when she arrived at the scene, the building was already destroyed. The girls, whose range in age from 4 to 17 years, have since been temporarily relocated to the Shaheed Boys Orphanage, at 157 Alexander Street, Kitty. That facility houses 16 boys. Rahaman said that for now the girls will be occupying the upper flat of the Kitty building, while the boys will be kept on the middle flat. 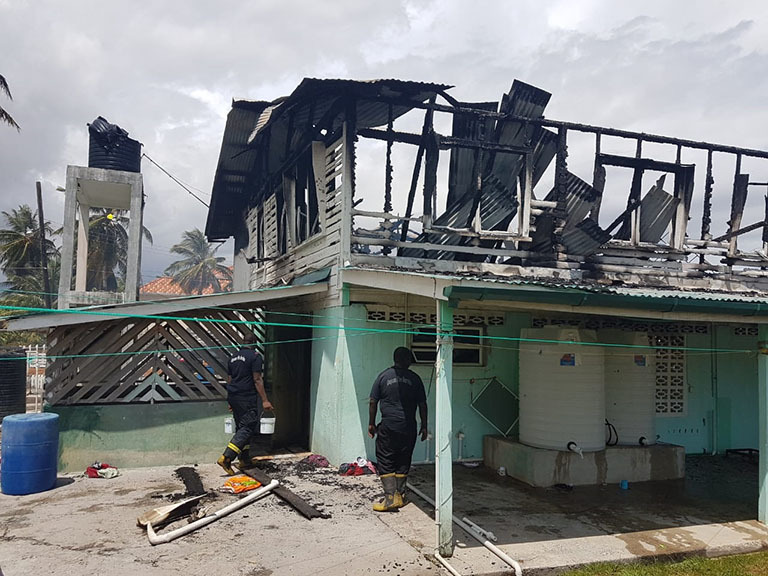 Guyana Fire Service (GFS) Fire Prevention Officer Andrew Holder yesterday told Sunday Stabroek that an investigation has been launched to determine to cause of the fire. However, a GFS source said investigators have received conflicting reports of what transpired. “There were several theories or several bits of information that were given by the occupants of the building. At different points in the day, this information seems to be changing significantly… but what we know for sure at this point in time is that the fire is not electrical, which is one of the notions they are trying to put forward,” the source explained. Investigators were said to have been in receipt of additional information yesterday afternoon as they continued to work to establish the cause of the blaze. 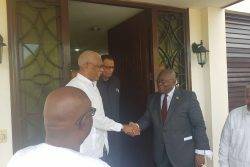 Meanwhile, Rahaman and other officials told Sunday Stabroek that the main focus presently is to rebuild a facility to accommodate the orphans. She said she is hoping that the rubble can be cleared within the next 24 hours and she made an appeal for public assistance so that the rebuilding can be done in the next three weeks. “…At the end of it, what we are trying to do is to make sure the scene is clear, remove the rubble and start rebuilding. The girls need a home to be put back in. Remember, they came from broken homes, so right now we are trying our very best to find a temporary solution here. We need to have something going to rebuild, reconstruct and set that place up back as soon as possible,” Rahaman’s nephew, who did not want to be named, explained. In order to make this possible, he said there is need for public support and donations. “We need the public support, we need donors, we need help, we need physical help and that’s the appeal we are looking for,” he added. She noted that the orphanage is a major factor of the girl’s lives. “…This is the home they know. This is what their lives revolve around and we want to have them back in their home,” Montaque added. The Shaheed Boys and Girls orphanages were established in the 1950s as institutions to provide care, home and facilities for the orphans, vulnerable and destitute children of Guyana. Persons who wish to render assistance can contact officials from the orphanages on telephone numbers 226-9620, 629-1001 and 643-5828.